From cinema to the web. 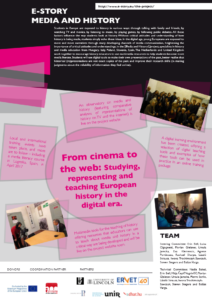 Studying, representing and teaching European history in the digital era. Students in Europe are exposed to history in various ways: They talking with family and friends, by watching TV and movies, by listening to music, by playing games, by following public debates. All these factors influence the way students look at history. Without critical attitudes and understanding of how history is being made, students simply echo these ideas. The fact that more and more of this expose to young Europeans - being digital natives - is happening through means, is not reflected in the way history is generally being taught. In the “Media and History” project specialists in history and media education from Hungary, Italy, Poland, Slovenia, Spain, The Netherlands and United Kingdom work together to encourage history educators to use multimedia resources to help students become more media literate. Students will use digital tools to make their own presentations of the past, better realise that historical (re)presentations are not exact copies of the past, and improve their research skills (in making judgments about the reliability of information they find online). More information is available on the website of the project and on the Facebook page of the project. Cover image from: "Tanti passati per un futuro comune? La storia in televisione nei paesi dell'Unione europea" by Luisa Cigognetti, Lorenza Servetti, Pierre Sorlin Marsilio, 2011. Interest a younger generation in learning about the humanities, such as history, to better understand the present, encourage their democratic participation in Europe, and promote a more conscious use of the web and its resources. Demonstrate how history and media are influencing each other by researching the way the past is presented on TV and the Web and by analysing how history is use in public debates today. Develop, test and promote open educational resources (audiovisual materials, teaching approaches) that meet the learning needs of digital natives and promote its use by teachers, trainers and students. Increase the professional skills of teachers (on media literacy, historical thinking, new technologies and new media) through a series of local and transnational training events and joint work on the development and testing of teaching resources. Strengthen cooperation between institutions / educational institution working on media and history education across Europe. A digital learning environment offering a selection of digital teaching tools and examples of how these tools can be used in practice, the possibility for teachers who registered to create their own learning activities online, and an online workshop for teachers. An online support center to ensure educators can use the digital learning environment without problems. A training package on media literacy that teacher trainers can use to help the history teachers they train to teach in a way that promotes media literacy. Multimedia tools for the teaching of history offering resources that educators can directly use to teach about media and history in a critical way. Training of 28 teacher trainers and trainee teachers in local and international training events. Steering Committee: Erin Bell, Luisa Cigognetti, Florian Gleisner, Ursula Jarecka, Eva Klemencic, Agnese Portincasa, Rachael Sharpe, László Strausz, Iwona Trochimczyk-Sawczuk, Steven Stegers and Balázs Varga. Technical Committee: Nadia Baiesi, Erin Bell, Mitja Čepič Vogrinčič, Florian Gleisner, Ursula Jarecka, Pierre Sorlin, László Strausz, Iwona Trochimczyk-Sawczuk, Steven Stegers and Balázs Varga.